E-Net Pay is a Digital Payment Portal which allows you to make online and offline payments to various merchants, transfer funds to various banks and many more. 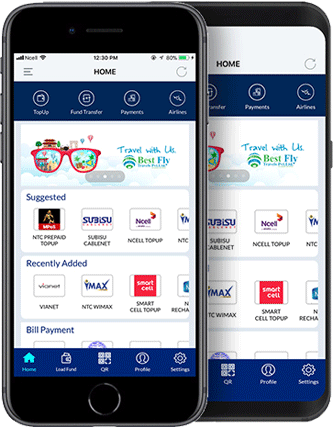 For example with E-Net Pay you can top-up your mobile, pay postpaid, landline and ADSL bills, buy bus tickets, airlines tickets and movie tickets, transfer money from one bank to another. Is E-Net Pay registration Free? Yes, E-Net Pay registration is absolutely free for everyone. Any Nepalese citizen above 18 years of age can register with E-Net Pay account via mobile or internet. Will I be charged for using E-Net Pay services? No, you will not be charged for any payments made to the merchants. However, services like fund-transfer to banks, etc may incur charges depending on the policies adopted by E-Net Pay. How can I register with E-Net Pay? a. You can register to E-Net Pay through web or in future you can register to E-Net Pay through mobile also. b. For web registration please visit E-Net Pay Portal https://enetpayment.com and fill the registration form and complete the activation procedure as instructed. I registered to E-Net Pay through web but I did not receive any confirmation mail? In this case, we suggest you to please check the spam/junk folder; sometimes, your mailing account might forward the mails to those folders. If this does not happen then please call us on our number 9801143444 or our toll free number 16600144477. You can verify yourself by updating your E-Net Pay profile with required documents. Logon to https://enetpayment.com, click on Preferences press profile menu and fill the details, provide the valid documents required and request for verification. Your details will be validated and approved by us to ensure the completion of your verification process. Visit your nearest E-Net Pay Pos with the identification verification documents. What documents do I required to become a verified user of E-Net Pay? - Your citizenship card (scanned or photo copy). - Your passport size photo (scanned copy or original). - Verified users are allowed to hold more than Rs. 9999 on their E-Net Pay wallet. - Verified users can receive money through remittance like GME Remittance. How do I use E-Net Pay through my mobile? Why do I need to prefund my E-Net Pay account? E-Net Pay is a digital wallet, if you have fund in your E-Net Pay account then you can spend it any way you like, mobile top-ups, recharge card purchase, ticket purchase, internet bill payment. How can I load/pre-fund my E-Net Pay Account? E-Net Pay offers two ways to load/prefund your E-Net Pay wallet. For the customers who don't have bank in his nearest office. They all can easily deposit fund from our E-Net Pay dealer office or E-Net Pay counter. Our dealer office situated at all provinces. You can ask your friends and family to transfer you money in your E-Net Pay account if they are already registered with E-Net Pay and have funds in their account. Can I transfer fund to another E-Net Pay User? Yes, you can transfer fund to another registered E-Net Pay user.